ViceVersa PRO is a file sync utility for Windows. ViceVersa PRO lets you sync files and folders between laptops, desktops, servers, hard-disks, NAS. ViceVersa PRO works locally or over the network, LAN, VPN. FREE Trial Download. 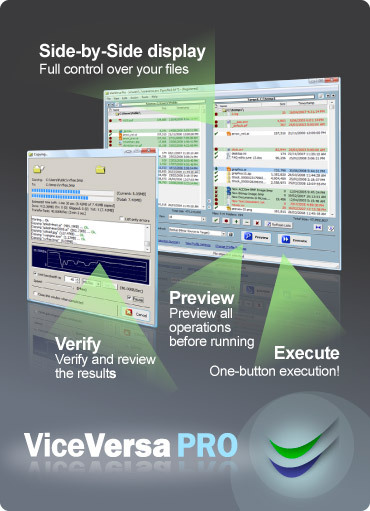 You can download and try ViceVersa PRO for free for 30 days. During this period the utility is fully functional with no limitations. ViceVersa PRO works on Windows 10, 8.1, 8, 7, Vista, XP, Windows Server 2016, 2012, 2008, 2003, 2000.